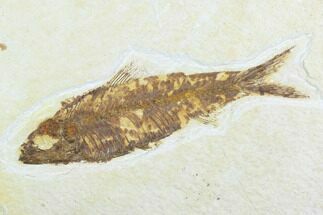 This is a large example of a 50 million year old fossil herring, Knightia eocaena. It was collected at Warfield's Quarry near Kemmerer, Wyoming, in the Green River Formation. 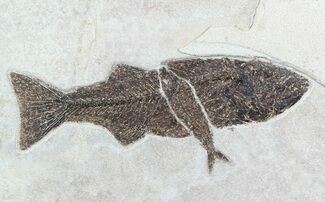 It's nicely preserved in detail including fins, scales and backbone. 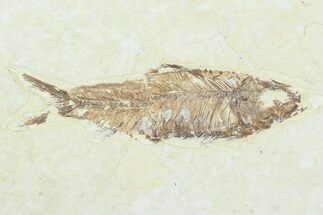 This specimen comes from the 18" layer of the quarry which produces much darker colored fish with better preservation than the split fish layers. It comes with an acrylic display stand. 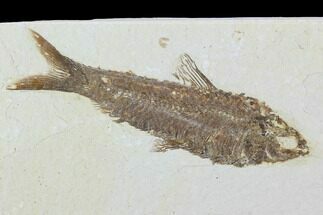 Knightia is an extinct genus of schooling, ray-finned, spindle-shaped, bony fish that shares a family with herrings and sardines. 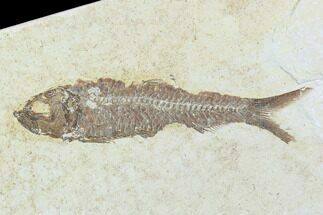 They lived in the freshwater (lacustrine) environments of North America and were eaten by just about everything that was bigger. They ate insects and smaller fish, and used gill rakers to feast on plankton. Knightia eocena is the largest of three species of Knightia, with a typical length of about 15 centimeters. 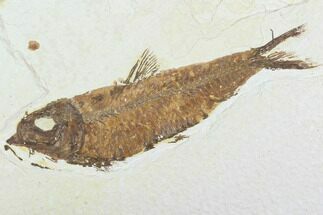 It is the state fossil of Wyoming. They have rows of dorsal and ventral scutes which ran from the back of the head to the medial fins. They had heavy scales, and small conical teeth. 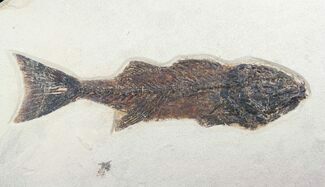 They are popular finds in the Wyoming lagerstätte, and were a primary food source to the large and hungry vertebrates of that once hunted the Green River Formation. The Green River Formation is an Eocene, geologic formation that records the sedimentation in a group of intermountain lakes in three basins along the present-day Green River in Colorado, Wyoming, and Utah. 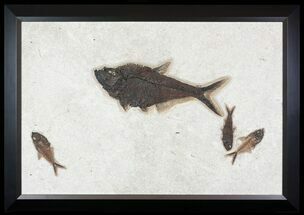 The Eocene spanned approximately 55.8 mya to 33.8 mya. This formation has distinct stratigraphy which displays alternating light and dark layers that represent seasonal erosion and deposition. Fresh water basins, charged by Uinta Mtns. on the Wyoming-Utah border, contained an enormous representation of taxa. The beginning of the Eocene was marked by warm upper latitudes, a greenhouse atmosphere rich in methane and carbon dioxide, and local climates stabilized by large lakes populated by such creatures as crocodiles. 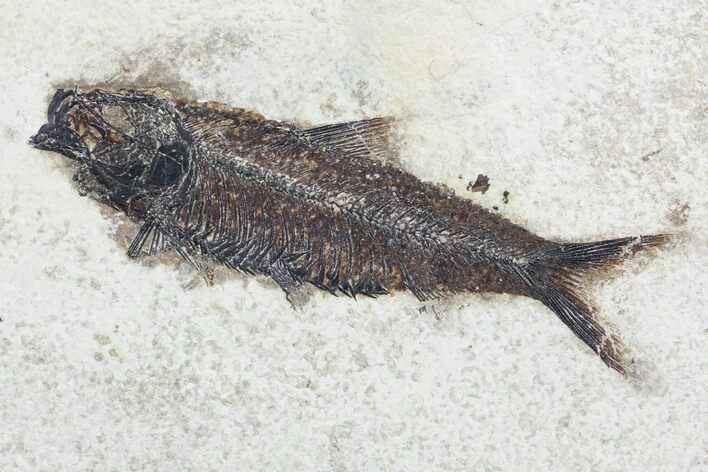 Fossil Lake in Wyoming is known for its well-preserved warm, lacustrine ecology. The end of the Eocene was dramatically different with the onset of icehouse climate characteristics, a change in atmospheric chemistry, and possible bolide impacts. 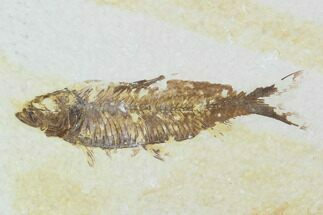 The Green River fossils date about 48 mya, but cover several million years, including the transition between the moist early Eocene climate and the slightly drier mid-Eocene.